Let’s assume you’ve got a new SQL Server under your support as a primary DBA and you’ve decided to investigate and document all the SQL Server components/features installed on this Server. What are your options? Will you go to Config manager and look at Services for Installed Services. Well, what about Client components? You can pull build levels/Version(SP/CU) easily for your database engine using T-SQL, what about other services? What about your client tool(s) version…Chances are they will be same as your DB Engine(but they could be different based on how and who patched the SQL Servers)? What if you’ve got multiple Instances of SQL Server with different versions…? 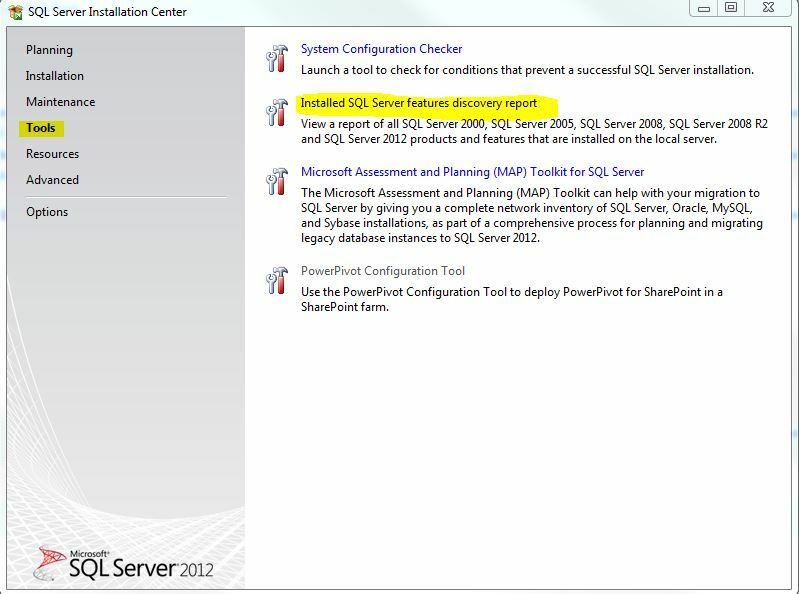 Well, we’ve something called “Installed SQL Server features Discovery Report” under Tools in your Installation Center which provides all this information in a single place 🙂 . Go to the Installation Center from your start->All Programs->Microsoft SQL serverXXXX->Configuration tools->SQL Server Installation Center. Go to Tools and click on discovery report as shown below. After few seconds, I got below report which gives me basic information on what all I’ve got Installed related to SQL Server on this Server with the build numbers, Edition, clustered/StandAlone etc all at single shot (You can see I’ve got 2 Named Instances, 2008 and 2012) which is pretty useful IMO.